OK, summer weather in San Francisco might not get much warmer, but that doesn’t mean our coffee orders don’t deserve summer upgrades. Some of these are spiked with chocolate and dolloped with rich whipped cream, while others are just extra-crisp cold brews served in a pretty outdoor area worth exploring. 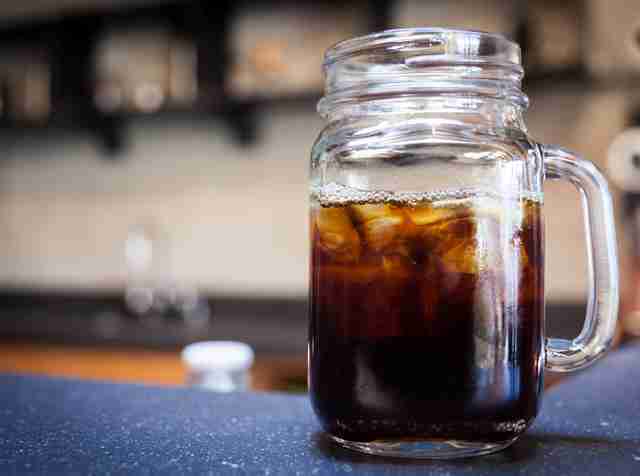 We rounded up the best (and most unusual) cold coffees for summer weather available in SF. This is what would happen if a Shirley Temple gave you a major caffeine buzz. 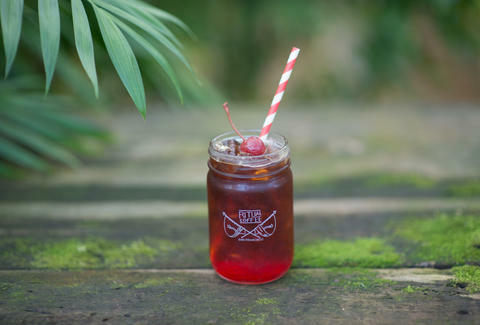 The Cherry Bomb combines the sweet cherry flavor of the classic little kid cocktail with a healthy splash of cold brew concentrate: Fever-Tree tonic water and maraschino syrup are added to Ritual cold brew in a mason jar, then topped with a maraschino cherry and an infinitely Instagrammable red and white striped straw. The Cherry Bomb is only available at Ritual’s Bayview location, which is located inside of Flora Grubb Gardens, which means you get to check out some lush greenery while you sip your coffee. A cup of mineral water spiked with two shots of Andytown espresso and a drizzle of simple syrup, then topped with a thick cloud of homemade whipped cream. Andytown’s creamy espresso concoction pays homage to "snowy plovers," the tiny birds you can see swooping and racing over nearby Ocean Beach. The coffeeshop has cozy indoor and outdoor seating, and it’s a short stroll to the ocean. Pro tip: pick up a slice of their homemade Irish soda bread or one of their outstanding savory scones. 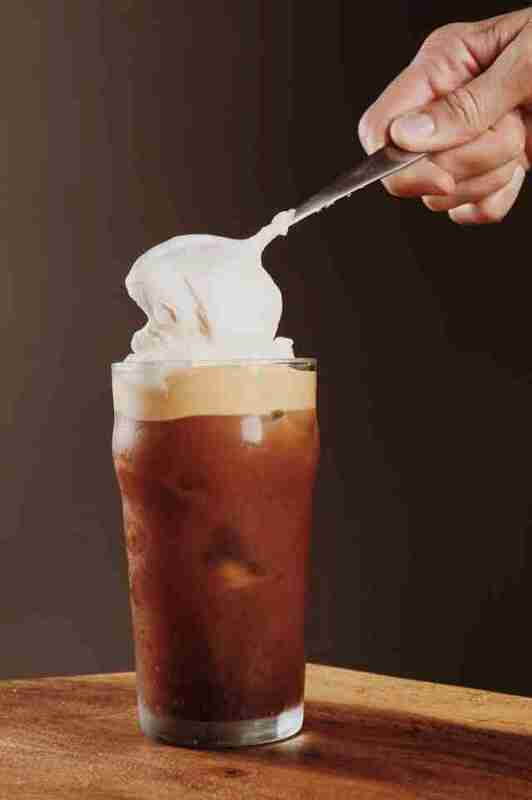 Nitro-coffee mania has hit San Francisco. If you’re in the market for a nitrous-blasted caffeine fix, Jane is the way to go. Their nitro packs a powerful caffeine wallop and a thick, Guinness-like texture. Sample their famous granola or buttery pastries, and enjoy the big glass windows and warm, minimalist interior of their Lower Nob Hill location. Flavorful without being cloyingly sweet, the Sightglass vanilla cold brew combines traditional cold brew with vanilla bean paste, a touch of agave, and your choice of almond or whole milk. It’s rich with warm vanilla flavor, and you can control the sweetness level by adding or skipping additional sugar. If you’re in the mood for a serious sugar bomb, try their affogato, an espresso, and ice cream mashup, in which they pair Sightglass espressos with Portland’s Salt & Straw ice cream. The two-story interior offers plenty of seating and is a great spot for dates or meetings, but be warned: these guys don’t offer Wi-Fi. 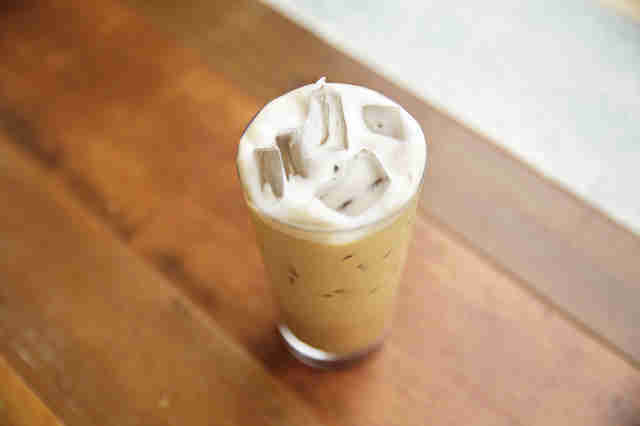 Home Cafe has an entire "Creative menu" of adventurous coffee drinks that you can order iced, but one of their most popular is the iced lavender latte, and for good reason: this unique drink combines an unusual, delicate lavender taste with a rich, classic latte, topped with bits of dried lavender. 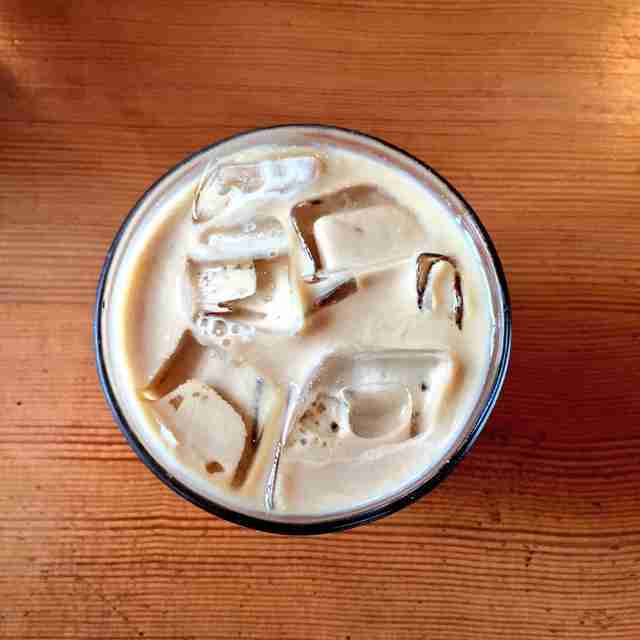 All of Home’s creative iced drinks contain two shots of espresso. The cafe offers a quiet, dreamy interior with plenty of outlets and big tables, perfect for work or studying. Check out their menu of bites, including their creative selection of sweet and savory toasts. 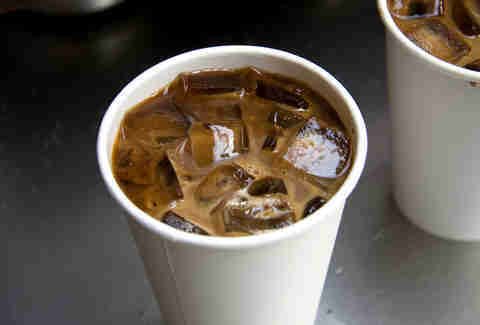 No list of cold local coffees would be complete without an ode to Blue Bottle’s famous New Orleans Style Iced Coffee. Blue Bottle whips up a lightly sweetened, 12-hour cold brew packed with roasted chicory flavor, then combines this dynamic and explosively caffeinated concentrate with organic whole milk. The Hayes Valley location is a tiny walk-up window with no indoor seating, so it’s a great spot for picking up an iced coffee before some Hayes Valley window-shopping. Consider this your cold-coffee breakfast, since it’s absolutely everything you need to start your morning off right. 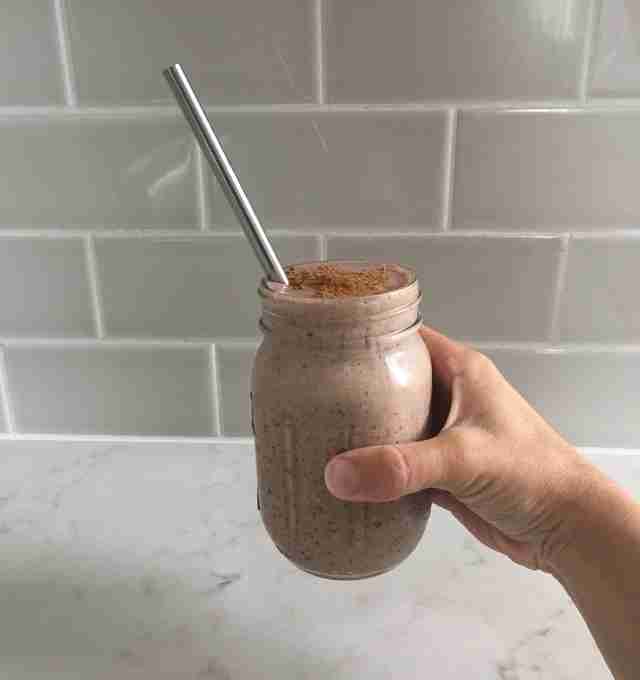 The Cocoa Almond Bliss is a smoothie packed full of Cafe St. Jorge’s homemade almond milk, banana, dates, cocoa powder, ice, and a shot of Stumptown espresso. It contains no refined sugar, but somehow tastes exactly like a chocolate-covered banana. This Californian Portuguese cafe features ample seating and plenty of outlets if you’re looking for a spot to work. Or stop by on a Saturday evening, when local bands and musicians play live concerts at the front of the shop. The smooth texture and clean flavor makes it so easy to drink, you may find yourself vibrating with caffeine a few minutes later. Don’t worry: a pastry or giant salad from their classic Californian breakfast and lunch menus will stave off any coffee crash. Reveille also boasts one of the best outdoor seating areas in the city, with a front patio offering plenty of seats and table space. It’s a great place to work, indoors or outdoors, but make sure to show up with a fully charged laptop, since Reveille has no outlets. 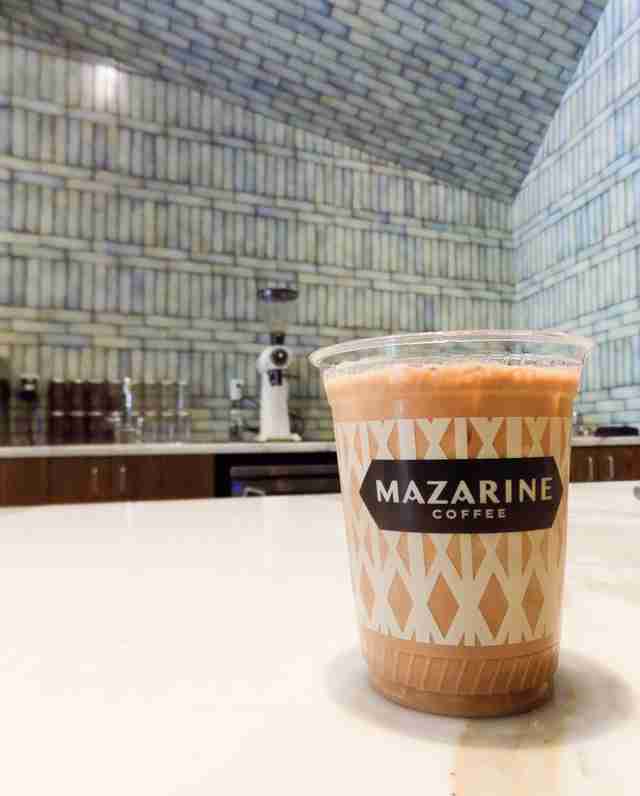 The backbone of the Mazarine mocha is a homemade chocolate ganache made out of single-origin Twenty-Four Blackbirds chocolate combined with organic Strauss Creamery whole milk and espresso. Go on a choose-your-own-espresso adventure and select between the options on the revolving espresso menu. The result is an intense blast of espresso-spiked-chocolate poured over ice. Mazarine has plenty of indoor seating and a small outdoor area in the front. If you’re looking for a second round of icey caffeinated beverages, try their nitro coffee or their nitro iced tea. The avocado toast -- on buttery, thick-cut bread with a lashing of soft salty cheese -- is as sublime as it is photogenic. 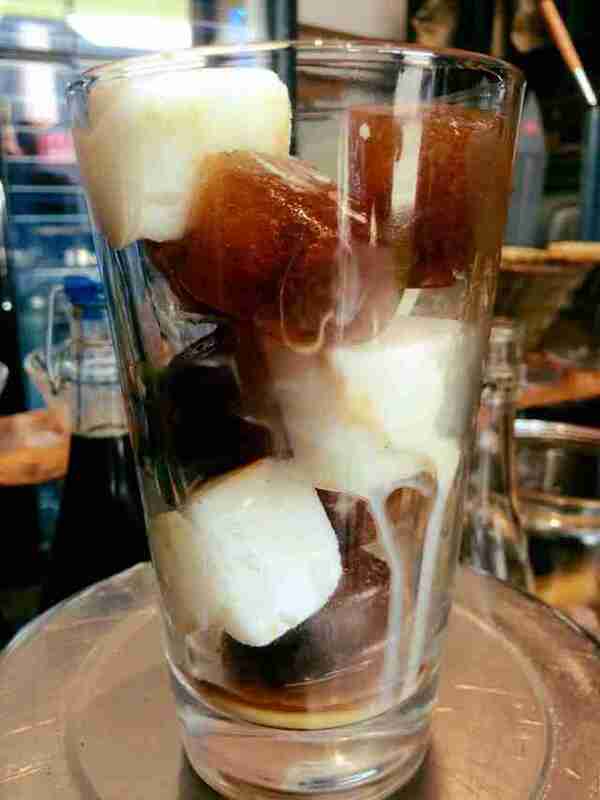 This ain’t no watered down-iced coffee: CoffeeShop Cold Brew, served with coffee ice cubes, is rich, almost chocolatey, and stays strong as the ice cubes melt down and replenish your coffee. There is minimal seating, and all of it is outside, so expect to take your coffee to go. Don’t forget to pick up a bag of Ubuntu beans before you leave. The owner, Wilson, and the staff are warm and welcoming, offer selection suggestions based on what you like, and will treat you to a free drink when you buy a bag of beans (which they’ll also cheerfully grind for you, upon request). Rice milk and heavy cream come together with Madagascar vanilla syrup, cinnamon, and 24-hour cold brew to create a plush horchata-laced iced coffee. It’s sweet and luscious with just a hint of cinnamon. The original Coffee Bar location has plenty of indoor seating and a small outdoor area. In a rush? You can place an online order any time before 4pm and get your drink to-go. Ginger often gets reserved for fall and winter, but we think it’s silly to abandon this flavor in the warmer months, especially when it pairs so well with coffee. The gingersnap iced coffee is shot through with bright ginger flavor; it’s cold and creamy with an unexpected undercurrent of spiciness. If you usually take your iced coffee black, but are looking for a flavorful twist, this drink is just as good without the milk and sugar. The Noe Valley location is right next door to Douglass Dog Park, so you can let your dogs for a romp when you get your caffeine on. Claire Margine is a super-caffeinated freelance writer living in San Francisco. Follow her @cmoshenb or check out her work at ClaireMargine.com.